Bubbling occurs in some clay bodies (especially those made from coarsely ground raw materials) if they are over fired; others just melt without bloating. Aggravating conditions that produce bloating include the presence of mineral particles (e.g. 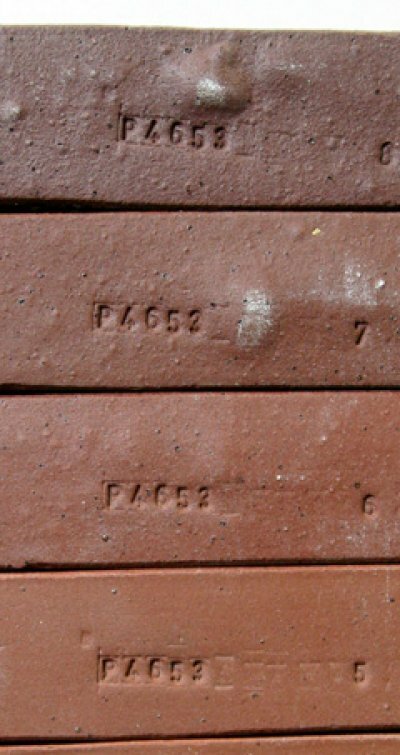 sulfates) that generate gases during the the firing stage at which the body densifies toward zero porosity, the presence of excessive carbon or carbon-containing particles not burned away by bisquit or oxidation firing, laminations in the clay matrix or the presence of an early melting glaze that seals the surface preventing gas escape. 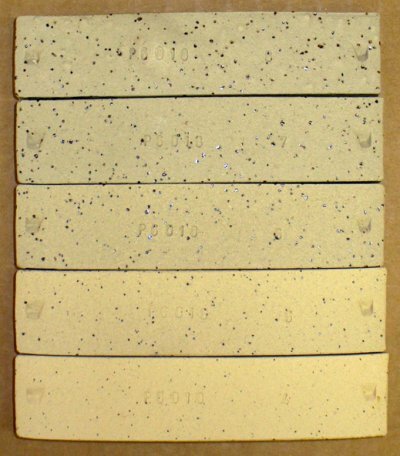 Clay bodies containing manganese granular particles to produce fired speckle will almost certainly bloat if over fired. 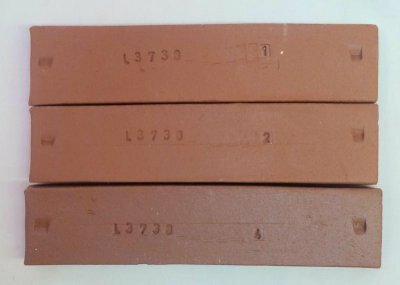 Many kilns do not have reliable shut-offs or have deteriorated temperature measurement sensors, thus overfiring can be quite common. It is best to confirm firing temperature using properly set cones to avoid bloating with touchy bodies. Better yet, fire the clay body to a temperature well short of an range where it might bloat. Finer grinding of the clay containing the offending particles will also help alot, enabling vitrifying the it more without fear of bloating (although warping will be an issue). 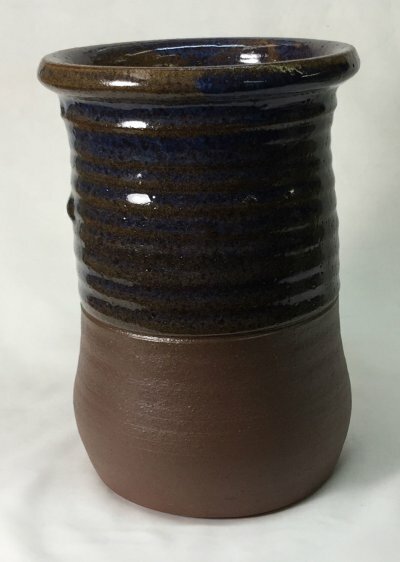 What happens when you fired a terra cotta at cone 5-8? This one can take more temperature than most. It looks OK at cone 5 (bottom bar). But at cone 6 bloating (bubbles) begin to occur. This body, while smooth to the touch, contains some iron and sulphate particulates that generate gases during firing, these are the catalyst for the bloating (the clay matrix becomes dense enough that it can no longer vent the gases of decomposition through it). Bloating in an over fired middle temperature high iron raw clay (Plainsman M2). It is still stable, dense and apparently strong at cone 4 (having 1.1% porosity). But between cone 6 and 7 (top bar) it is already bloating badly. Such clays must be fired at low enough temperatures to avoid this volatility (if accidentally over fired). 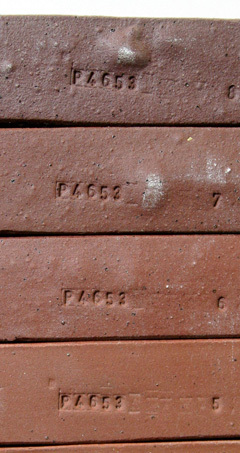 This clay only reaches a minimum of 1% porosity (between cone 4 and 5), it is not possible to fire it to zero porosity. This is because of the particulate gas-producing particles (it is ground to 42 mesh only). Cone 6 iron bodies that fire non-vitreous and burn tan or brown in oxidation can easily go dark or vitreous chocolate brown (or even melting and bloated in reduction). On the right is Plainsman M350, a body that fires light tan in oxidation, notice how it burns deep brown in reduction at the same temperature. This occurs because the iron converts to a flux and the glass development that occurs brings out the dark color. On the left is Plainsman M2, a raw high iron clay that is quite vitreous in oxidation, but in reduction it is bloating badly. When reduction bodies are this vitreous there is a much great danger of black coring. 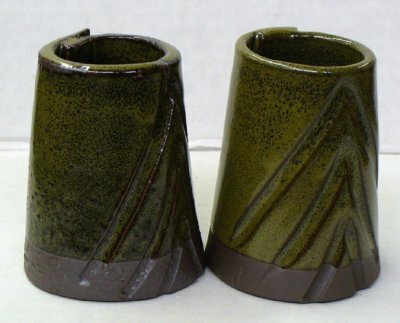 Example of a buff stoneware clay bloating at cone 10 oxidation (whereas it appears very stable at cone 8). Here is a good reason not to have single-temperature-tunnel-vision when evaluating or using a clay body or clay material. 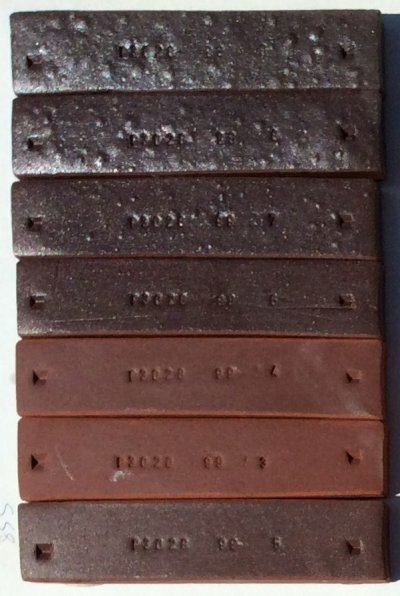 This high-iron clay looks great at cone 3 or 4 (the bottom bar is cone 5 and out-of-place). But by cone 5 the solubles (invisible at lower temperatures) begin to melt. Shortly after it rapidly descends into serious bloating and then melting by cone 8. 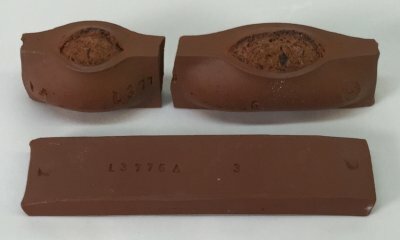 What on earth is happening with this fired clay bar? Bloating in clay bodies occurs when the firing goes high enough to seal the surface and prevent the passage of gases releasing inside.